Observe, discuss and define aspects of the history of Australian newsreels. Discuss the production of the archival clip in its historical context. Compare the arhival clip and modern TV news production techniques and how audiences are targeted. Script and deliver a narration voice-over to accompany a silent newsreel clip and choose appropriate music to accompany it. Students are required to view and discuss media products from a variety of past and present social and cultural perspectives. Students should also demonstrate an understanding of how histories are constructed in media both reinforcing and challenging values in the social, cultural and historical contexts in which they are produced. Describe the way the archival video presents the news item, and the story the images tell. Consider camera shots- the angles used and types of shots; high, eye level and low to create the atmosphere of the show. Describe the types of events that were typically filmed by newsreel camera crews and screened to Australian audiences. Scripting, timing and presenting a newsreel narration. 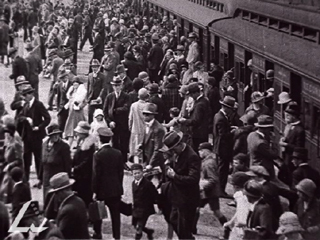 Time the running length of the 1926 Royal Melbourne Show video clip, then in groups, plan and draft a script for it, as though it were a voiceover description to be delivered by a narrator. Make sure the narration suits the on-screen images, and that its running time is no longer than the length of the video clip. Practise reading it out loud within the time limit, then deliver your narration to your teacher while the newsreel is screening. You may be able to record your narration, with a suitable music soundtrack, which can be used during pauses in the commentary, so that it may be played simultaneously with the video.